Over 20 speakers addressed these various questions over a two day program. Some of the conference speakers gave film interviews. 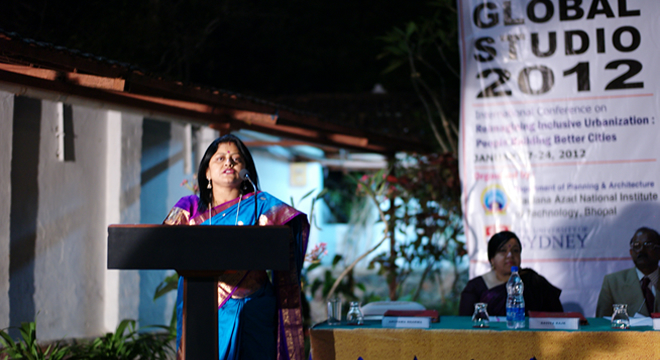 More than 150 people attended the official opening of Global Studio and the Conference on January 7. Shri. S.P.S. Parihar (IAS) Principal Secretary, Urban Administration & Development Department Govt. of Madhya Pradesh welcomed Global Studio to Bhopal and outlined key urban challenges facing Bhopal . Indian speakers included Sheela Patel from SPARC and Renu Khosla (C.U.R.E, Delhi) who spoke on community participation, the new ‘buzz word’ in Indian planning policy, but as they pointed out it needs to be enabling and empowering and not tokenistic. Dr. Ajay Suri from Delhi focused on the Cities Alliance approach to cities in India. Professor Geetam Tiwari (IIT Delhi) spoke on an inclusive approach to transport planning, and CEPT (Ahmedabad) Associate Professor and architect Mehgal Arya outlined the participatory approach to the design of bus stations for Ahmedabad’s BRT system. They built a full size model of a station to get people’s feedback before proceeding wth the final design. Architect Anupama Kundoo stressed the importance of green design, and argued for approaches that would impact the whole population, and that would learn from traditional design as well as the use of materials and skills. International speakers provided other perspectives on inclusive urbanization. Paul Pholeros, Sydney architect, director of Healthabitat and winner of the 2011 UN World Habitat Award for his work with Indigenous Australians spoke of the need to work together with people to make healthy housing. He emphasized the need to build capacity employment and skills, and also showed examples of how he did this in Nepal as well as Australia. Nad Luansang, an architect from Thailand works with ACHR (Asian Coalition for Housing Rights). He heads an improvement program in 100 cities in Asia, and spoke about effective community-professional partnerships. Rodney Harber provided lessons from South Africa. Steve Zavesotski from the University of San Francisco worked in Bhopal in the mid 2000s on the Union Carbide disaster, and discussed the role of community health in inclusive urbanization. 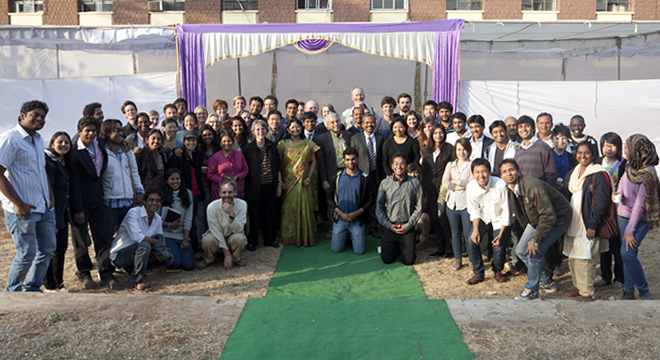 Other speakers such as well know environmental justice scholar, David Schlosberg and Phil McManus (both from University of Sydney) as well as Andrea Nightingale (University of Edinburgh) spoke on environmental justice, gender issues in relation to incisive urbanization, and possible climate change scenarios for India in coming years. Rethinking professional education and practice for inclusive urbanization.